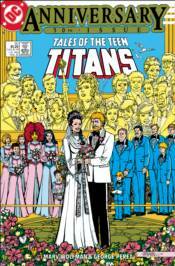 While the team battles Dr. Light in Central City, Donna Troy prepares for her wedding! Then, the government tries to get the team to turn Jericho over for questioning, and Deathstroke goes on trial for the death of Tara! Plus, the Fearsome Five attacks S.T.A.R. Labs, and Cyborg considers becoming fully human again! Collects TALES OF THE TEEN TITANS #49-58.